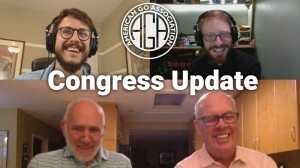 Andrew Jackson and Michael Wanek are back with another video update on this year’s US Go Congress, th is time with Congress directors Les Lanphear and Ted Terpstra. Lanphear and Terpstra talk about some of the highlights of this year’s Congress and remind those thinking about attending that Early Registration ends June 1st, when registration price and meal plan prices increase. Also, they note, after June 1st, the rooms at the hotel — “And it is an amazing venue!” says Wanek, who just did a site visit last week — will not be guaranteed.